How letting agents can attract and convert new landlords by using creative and innovative marketing tactics. Landlords are elusive creatures. Hard to find, difficult to market to, and almost impossible to poach. Most traditional methods of marketing just don’t work on landlords. With a vendor, at least you know where they live. Trying to reach a landlord through a property they own is like playing hide and seek with the Invisible Man. But a landlord can be so much more lucrative than a vendor, in the long run. At an average revenue of £1000 a year per property, a portfolio landlord can keep your cash flow sweet for years, if you look after him. So how do you attract more landlords into your fold without spending a ton of time and money on marketing each month? Having coached to over 1000 letting agents in the past twelve years, and helped them set up robust and successful marketing systems, I’m going to share with you some of the tactics that I know absolutely work. By the time you’ve read the list below, you may be wondering where to start, and which ones are right for your specific business and circumstances. Firstly, you need to decide on the type of landlord you want to attract. I like to categorise them as Newbie, Accidental and Pro. The Accidentals have inherited a property they rent out, or had to move house without selling their home, so rented it out instead. They can be emotionally connected to the property, sometimes making them unreasonable in their demands on the tenant, and over-sensitive to any problems that occur. The Pros are portfolio landlords. Well-informed (so they think), sometimes slightly arrogant, and very reluctant to change their management agent without a massive discount in fees as a sweetener. That leaves the Newbie. This is the guy that’s watched Homes Under the Hammer and decides to go pro. Just the small problems of the lack of funds, no financing agreement and little time (he works full time) are holding him back. Despite these challenges, he’s super ambitious and determined to make it work, and best of all, he needs you. He’ll listen to what you say, take your advice, and won’t usually haggle on fee. If you can take him from zero to three properties in the first year or so, he’ll stay loyal forever; eventually becoming the Pro we talked about earlier, and (hopefully) impossible for anyone else to poach. Once you’ve decided to focus on the Newbies, he can guide your marketing much more effectively than trying to attract all types of landlords with your efforts. 1. Direct mail – instead of touting for vendors each time a property in your patch comes onto the market, wait 10 weeks and send them a nice individual letter; in it, give them a guide rental value if they decide not to sell, and inviting them to have a chat with you about their options. 2. Content – if you don’t already write a blog, start one now. Focus specifically on the journey from the first buy-to-let up to around six units. Write about financing options, tax implications (you can use expert guest contributors) and Google-able phrases like ‘What to do if your tenant gets a dog’. 3. Networking – sounds obvious, but are you actually getting out and meeting people? Ten years ago, this was the only way that letting agents had to generate new business. It doesn’t have to be the usual breakfast meetings and Chamber of Commerce, you can offer to do a talk for the local Rotary Club, join the gold club and attend community events. It’s all good networking, and making your face more familiar is the goal. 4. Write the definitive guide – this is one thing I do with my clients that instantly sets them apart, gives them credibility and positions them as an expert in their field. You know more than you think you do; you just need to write it down. If you’re not a natural writer, have a copywriter interview you, and turn your answers into an ebook. 5. Facebook group – set up a private Facebook group for landlords to ask questions and discuss buy-to-let issues, in a safe environment that you control. Whilst the organic reach (number of people who see your posts) may be almost zero, Facebook groups have a great reach, often with everyone in your group seeing what you post. 6. Facebook re-marketing – you can use Google Adsense to follow certain search terms round the internet, but I prefer Facebook re-targeting by far. Pixel your website, and you can serve an advert on Facebook to those people who have visited any page on your site, or even those who have visited specific pages. And Facebook advertising is cheap; really cheap, right now, but it won’t stay cheap forever. 7. VIP list – invite new and ambitious landlords to a special list where they will receive early notification of investment properties. To make it even more valuable to them, task someone in the office to source new investment deals each week and send the best out to your list, regardless of the agent offering the property. That way, you’ll get third party credibility as an impartial source of information for landlords. 8. ValPal – (or other online valuation tool) – this is giving some of my clients all their leads at the moment. But you have to be really tactical with it. The way you drive traffic to the page, how you make sure as many people as possible complete the form, how you re-market to the ones that don’t, and then how you follow up with the submissions, – all these elements make the difference between success and failure of the tool. NOTE: if you’d like to get a discount off ValPal, message me and ask for my special link. 9. Video marketing – videos can rank so much more easily and effectively than the written word. My friend and brilliant video marketer, Andrew Gunn from Videoseen helps companies get found for keywords you wouldn’t stand a chance for using regular content. With so much competition for phrases like ‘estate agents Yourtown’, you need to be harnessing the power of video to really stand out on Google. 10. LinkedIn – sometimes dubbed ‘the professional’s Facebook’, LinkedIn can be a really lucrative source of landlords. Not only can you publish your articles on LinkedIn free of charge, you can also conduct the most advanced searches on there, than on any other social media platform today. Being a Premium user gives you an advantage over standard users, with more search functions and the ability to send out Inmails to those people not connected with you. 11. Events – hosting a Landlord Advice Evening can be a great way to connect with new landlords, and demonstrate your expertise. Hire a nice venue (don’t use your office – it looks too salesy), invite along a couple of experts to speak, and if it’s a success, schedule a regular event every couple of months. You’ll soon build a reputation as the go-to lettings and investment expert in your town, and your competitors will be kicking themselves that they didn’t think of it first. 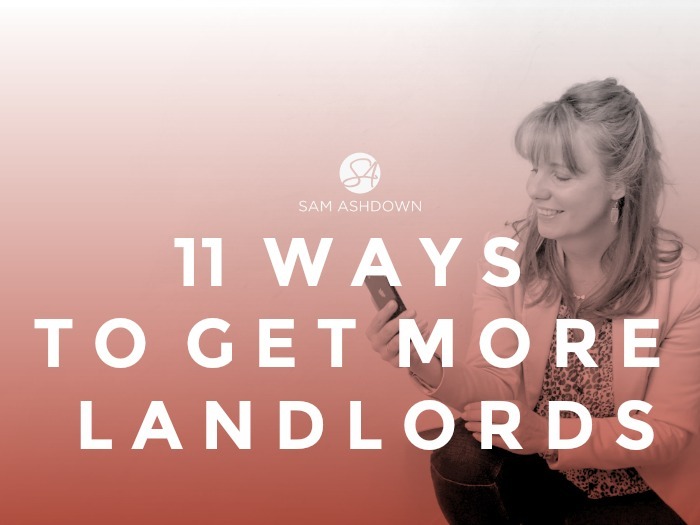 So there you go; 11 innovative ideas to attract new landlords. None of them need to cost a fortune, and at least half are totally free. We live in very exciting times, but sometimes the choice of marketing options feels overwhelming. To help you make sense of it, and decide on a clear, simple strategy that will really boost your business and set you apart from the competition, I’ve created a unique course: The Landlord Attraction Blueprint. If you would you like to attract a predictable and consistent flow of landlords, through sophisticated automated online marketing, this course will give you exactly that. The Landlord Attraction Blueprint is a unique training course exclusively for independent letting agents. The training will walk you through the step-by-step process for building an online marketing funnel that attract landlords, nurtures them and turns them into enquiries and meetings. By using advanced online marketing techniques, you’ll quickly be able to implement strategies that your competitors don’t even know exists – reaching landlords online through advanced targeting. Just go to my DIY Marketing Courses page where you’ll find more details of the Landlord Attraction Blueprint and you can decide if it’s right for you. Supporting landlords in better communication with tenants.